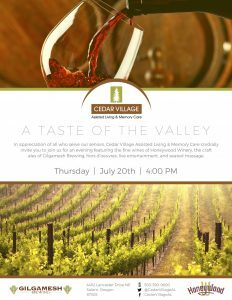 Cedar Village Assisted Living & Memory Care invites you to A Taste of the Valley, an event in appreciation of all who serve our seniors. The event will feature fine wines from the Honeywood Winery, the craft ales of Gilgamesh Brewing, hors d’oeuvres, live entertainment, and seated massage. For more information, please contact Dawn Hull: marketing@cedarvillageseniorliving.com /971-701-3372.